Wright State University students who are victims of domestic violence or assault have a new advocate they can turn to. Corrie Pleska, a licensed social worker and Wright State grad, is the university’s new survivor advocate and case manager. She provides support and resources to student survivors of power-based violence, including domestic violence, sexual assault and stalking. She is available to confidentially talk to and meet with students and provide help if they need it. Students can contact Pleska on her 24-hour on-call number, 937-775-2727, or at corrie.pleska@wright.edu. Her office is located at 022 Student Union. “I have an open-door policy. If students ever need anything they can see me or call my 24-hour number,” she said. Services she offers students include referrals to Montgomery, Greene and Clark County offices that provide services to assault victims; guidance for applying for protective orders through the legal system; and assistance with temporary accommodations, accessing victim compensation and acquiring legal representation. Pleska will also accompany victims to legal hearings or the hospital if needed. She is available to meet with students and help them weigh their options before moving forward with any permanent decision. Pleska is available to assist students regardless of where or when their victimization occurred. Pleska has started a support group for student survivors that meets every Tuesday from 3:30 to 4:30 p.m. in the Pioneer Room of the Student Union. She has also organized a monthly campaign that provides both education and raises awareness of her new position. Since joining Wright State at the beginning of the fall semester, Pleska has found a welcoming response. 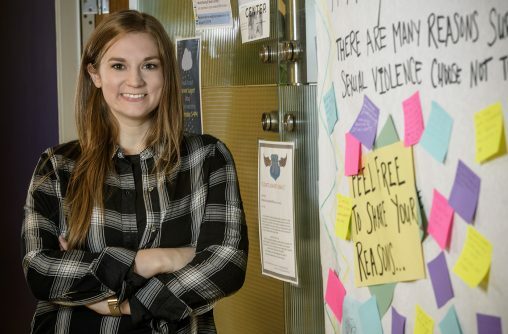 Pleska’s position is fully funded by a grant the university received through the U.S. Victims of Crime Act, which provides funding to the university to provide support services to survivors who are students. Pleska received a bachelor’s degree in communication, with a minor in women, gender and sexuality studies, from the University of Cincinnati. She wanted to work with victims of domestic violence and sexual assault, so she pursued her master’s degree in social work at Wright State, graduating in 2016. During her time in the Social Work Program, Pleska benefited from an intense internship with the Divert Program in the Greene County Family Violence Prevention Center. She worked with police jurisdictions in the county to respond to active domestic violence incidents. She also started a sexual assault support group and a sexual assault coordinator position to work with survivors, and worked with perpetrators of domestic violence through the Domestic Violence Intervention Program. Pleska was inspired to work with victims of domestic violence and assault by an aunt and grandmother, both of whom are survivors. “It’s a really difficult thing to go through and when someone trusts you to be a part of that, to help them even more so, I see that as a privilege, it’s a humbling thing. To see how resilient and strong people are every day is really encouraging,” she said. Pleska was interested in returning to Wright State as the survivor advocate and case manager because the position offered the opportunity to help students and work for broader change. “I get to work with individual clients, but I also get to talk about those big ideas and try to find a way to make it a reality,” she said. Changing how society views power-based violence will make it easier for survivors to feel supported, she said. “It will help them to heal and help us in reducing the amount of violence that we see,” Pleska said.